Shearman & Sterling and Baker Botts Litigation Partners Steven Molo and Jeffrey Lamken Establish Firm with Offices in New York and Washington, D.C. Nationally recognized litigators Steven F. Molo and Jeffrey A. Lamken today announced the formation of MoloLamken LLP, a litigation boutique with a national practice focused on complex, high-stakes civil litigation, white collar criminal defense, U.S. Supreme Court and appellate cases, and regulatory matters before administrative agencies. Molo is leaving Shearman & Sterling in New York, where he was a partner in the litigation group. He was previously a partner with Winston & Strawn in Chicago for 18 years and served on that firm’s executive committee. Lamken was the head of the Supreme Court and appellate practice for Baker Botts in Washington, D.C. and previously served as an Assistant to the Solicitor General in the U.S. Department of Justice. Lamken also clerked for the Honorable Sandra Day O’Connor of the U.S. Supreme Court and the Honorable Alex Kozinski of the U.S. Court of Appeals for the Ninth Circuit. Molo and Lamken bring an established record of success in high-profile cases to their new firm. Molo recently successfully defended former Reagan cabinet member David Stockman, who had been charged with securities fraud in New York following the bankruptcy of auto supplier Collins & Aikman; all charges were dismissed. He has been involved in a number of notable matters arising from the current financial crisis. Lamken represents parties in four matters pending before the U.S. Supreme Court this Term; he has argued another 17 cases before the Supreme Court. Molo and Lamken also recently worked together to successfully reverse a $1.6 billion verdict against Morgan Stanley that a Florida jury had awarded to Coleman (Parent) Holdings, a company controlled by financier Ron Perelman. With initial offices in New York and Washington, D.C., MoloLamken will represent both plaintiffs and defendants in trials, appeals, grand jury and regulatory defense, and internal investigations. With a focus on quality and experience, and an intention to remain small in size by today’s law firm standards, the firm’s strategic plan calls for measured growth over the next three to five years with the objective to build a team of 40 to 50 attorneys. Molo noted that despite the broader economic and legal industry downturn, market conditions are heightening the demand for agile and experienced litigation counsel. He believes the success of his and Lamken’s new venture will be enhanced by a growth in complex litigation due to the recession and the re-organization of the financial services industry, as well as continued growth in intellectual property and product liability litigation. Consistent with MoloLamken’s strategy, the Wall Street Journal’s recent front-page story highlighting a growing mandate for flat-fee billing arrangements among the largest corporate purchasers of legal services reinforces the dynamics behind the firm’s creative fee arrangements that lower costs and provide predictability for clients. According to the Wall Street Journal report, money spent on alternative billing arrangements has totaled $13.1 billion this year, versus $8.6 billion during the same period in 2008, and corporate counsel say they plan to further increase their use of alternative fee arrangements in the coming year. 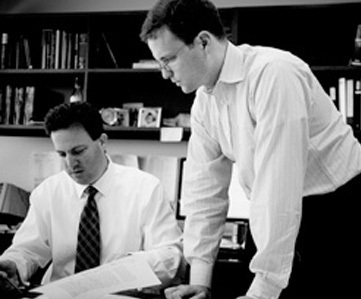 “We are proud to have come from Shearman & Sterling and Baker Botts, two world-class law firms. We would be pleased to have the opportunity to collaborate with them in future,” explained Lamken. Technology – The firm’s size allows it to implement and upgrade leading litigation and back-office technologies with less expense and less time. Multiple Office Platform – The firm has launched with a multi-office strategy driven by business opportunity, a rarity among litigation boutiques. The firm’s offices are located at 350 Park Avenue in New York and 600 New Hampshire Avenue NW in Washington, D.C. Exceptional Talent – Focused on providing clients with experience, judgment, and superior counsel at every level, the firm plans to only hire associates with at least two years’ of experience, preferably more, with an emphasis on those who served as judicial clerks. In addition, the firm will do no law school recruiting and have no summer associate program, thus allowing it to avoid overhead that is non-essential to its model. The successful defense of the former CFO of Symbol Technologies charged with 22 counts of securities and mail fraud based on alleged accounting irregularities. Five cooperating witnesses testified during a seven-week trial which resulted in a hung jury and a resolution involving no jail time for the client. The defense of BARBRI, the nation’s largest bar review provider, in antitrust class actions in New York and Los Angeles which were settled. The successful defense of Aon in a jury trial involving allegations by the former CEO of re-insurance broker Swett & Crawford, who claimed the company owed him in excess of $15 million in bonuses at the time of his departure. The successful defense of Morgan Stanley and Van Kampen in obtaining the dismissal of class action suits in Chicago and New York which challenged their methods of operating their mutual funds. The successful defense of Hub International, obtaining dismissal of consolidated civil antitrust class actions in New Jersey. Significant victories in the Illinois Supreme Court in separate cases for UBS (striking as unconstitutional a portion of the Illinois Whistleblower Act in a municipal bond “yield burning” case) and a group of prominent banks (striking as unconstitutional certain limitations of the Illinois Interest Act). While at Winston & Strawn, he represented a wide range of corporate clients, executives, politicians, and entertainers in a variety of notable matters. Successfully obtained a decision of the U.S. Court of Appeals for the Second Circuit overturning a district court decision that had enjoined the implementation of a remote storage digital video recorder as a violation of the Copyright Act. Successfully defeated a petition for a writ of certiorari in the U.S. Supreme Court, notwithstanding seven amicus briefs in support of the petition. Filed a successful petition for a writ of certiorari of behalf of an energy company, obtaining U.S. Supreme Court review of a decision of the D.C. Circuit regarding the circumstances in which Federal Energy Regulatory Commission can overturn wholesale power rates agreed upon by contract. The case is now pending before the Supreme Court. Filed a successful petition for a writ of certiorari on behalf of gasoline refiners and distributors regarding the circumstances under which a service station operator may bring suit against an oil refiner or distributor for "constructive termination" under the Petroleum Marketing Practices Act. The case is now pending before the Supreme Court. Successfully represented an energy company on appeal in the Fourth Circuit, obtaining a decision holding that federal law preempted a Baltimore County zoning ordinance regarding LNG terminals. Also joining MoloLamken as partners are Michael G. Pattillo, Jr. and Robert Kry. Before joining MoloLamken, Pattillo practiced with Baker Botts and Williams & Connolly. He clerked for the Honorable Nathan L. Hecht of the Supreme Court of Texas and the Honorable Stanley F. Birch Jr. of the U.S. Court of Appeals for the Eleventh Circuit. He is a graduate of the University of Texas School of Law. Before joining MoloLamken, Kry practiced with Baker Botts. He clerked for the Honorable Antonin Scalia of the U.S. Supreme Court and the Honorable Alex Kozinski of the U.S. Court of Appeals for the Ninth Circuit. He is a graduate of Yale Law School. MoloLamken LLP is a litigation boutique with a national practice focused on complex, high-stakes civil litigation, white collar criminal defense, U.S. Supreme Court and appellate cases, and regulatory matters before administrative agencies. For more information please visit www.mololamken.com.